After nearly six years in Jeddah our life was suddenly upturned when I was promoted to Training Specialist in charge of our operation in Dhahran, 750 miles away on the Persian Gulf. We first lived in a house in Al-Khobar consisting of two portacabins on top of each other, but later transferred to a luxurious house in a compound in the desert near Dammam. The Eastern Province was quite different from the Hejaz. The climate was even hotter and more humid in the summer, but in the winter it often rained, and there was consequently a reasonable amount of vegetation, especially in the oases. This is where the oil is, and so there has been a large influx of Sunni Muslims, but the indigenous population were Shiite, like Iranians, and so the culture felt quite distinct. I was much more mobile in my work, giving classes in the oases of Hofuf and Qatif, and also in Jubail. This involved journeys by car, train or bus of up to 80 miles both to the north and the south. At first my base was at the old airport, but later I moved into Al-Khobar. Julia, who was only just four, joined Philip at the British-Dutch school, later absorbed by the American Dhahran Academy. We continued to travel widely, with visits to Seoul, Hong Kong, Gwangdong, North Yemen, Cairo, Dubai and Qatar. On a weekend in Hofuf we attended a camel race in the nearby desert. But the camels and four-wheel-drives, which drove alongside them, threw up so much dust that we saw very little of the animals or their child-jockeys! By 1988, after nearly nine years in Saudi Arabia, we were ready to return to Britain. Our life in the Eastern Province had less to offer Angie and the children, and I wanted to study psychology. Accordingly, in September Angie, Philip and Julia moved back to Brighton, and Philip and Julia started at the Steiner School, then in two detached houses in Ditchling Road. I stayed another four months, during which time I managed a weekend trip to Karachi, where I bought the nested tables we still use here, and a visit to the edge of the Empty Quarter. On the latter, my Saudi friends and I were intending to relive the bedouin life of their grandparents. After a spectacular sunset and the Maghreb prayer, we sat under an brilliant celestial display, warming ourselves at a fire and drinking tea to the sound of snorting camels. But then a television, which had been attached to a Land Rover battery, sprung into life, and we spent the rest of the evening watching sumo wrestling! In January 1989 I started my MA course in the Psychology of Therapy and Counselling in London by commuting once a week from Dhahran! At the end of that month I moved back to Brighton for good and have been home-sick for the Middle East ever since. At first I earned my living teaching English at a couple of language schools, at Brighton Polytechnic, as it then was, and at Northbrook College. But once I’d gained my MA, I concentrated on counselling, mostly in two doctors’ surgeries in Hove. 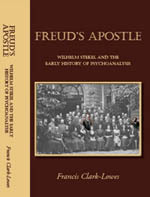 In 1993 I started my doctoral research at Sussex University on the early psychoanalyst, Wilhelm Stekel, about whom I finally published a book last year. Life was not as easy as it had been in Saudi. Our financial situation was worse, our beautiful large house became a burden, and the children missed the sun and freedom of Saudi and their international friends. Neither of them was happy at Blachington Mill, where they went for their secondary education. And I was preoccupied with my work and research, involving several trips to Vienna. No doubt I was also going through a mid-life crisis. To cut a long story short, in 1995 Angie and I separated, though we continued to live in the same house for another year and a half. We sold this in 1997 and simultaneously bought our own houses, Angie in Hove and I in Trafalgar Terrace. But I will leave an account of the whys and wherefores of that move to a final episode of this series.